By way of a brief label introduction, Trapdoor Tapes are a micro-tape label from Australia that has issued around 80 releases in relative obscurity since 2005. Releasing material from both local projects and known international acts, the general focus is on the murky end of underground noise and industrial they have carved out their own particular niche, issuing limited editions with a lo-fi sound and rough DIY photocopied visual aesthetic. Following below is a short rundown of a recent batch of releases from the label. Amour Group is up first and a rather mysterious project. From the limited available information Armour Group is an Australian act involving Harriet Kate Morgan & Luke Holland. ‘Live Assault’ seems to be debut release and as is suggested by the title is a 16 minute tape of two short live recordings (…or perhaps are excerpts of longer live sets?). Here the sound is concerned with ominous shuddering industrial noise with a rough, grinding, reverb drenched tone. Mangled vocals are then spewed forth over this analogue base, whipping in their distorted intensity. Being rather loose and chaotic but also maintaining a vague sense of structure, the predominant lower end rumble occasionally breaks out into a high pitched noise squall. Likewise with the recording being somewhat muffled in tone, it only tends to amplify the audio grit. Essentially the static fried frequencies, cascading noise, war zone samples and muffled industrialised rumble generates fierce and oppressive battlefield ambience. 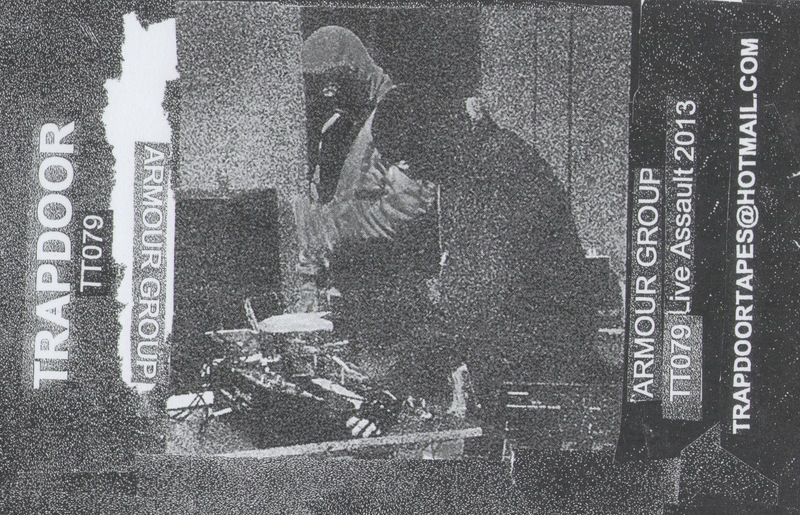 In a no-frills capacity Armour Group deliver a grime and chaos infused atmosphere which builds to overblown intensity. Solid and aggressive stuff. Up next is a new tape from hyper productive German Army (in excess of 20 releases since 2011) which delivers another eclectic offering. Possibly to be described as a bizarre version of post-punk mixed with tribal post-industrial, this description still does not quite do this justice. To provide another marker there is something similar to the quirky playfulness of Deutsch Nepal, but which German Army also entirely make their own. Being less post-punk and slightly weirder in scope than other German Army material I have heard, there is a psychedelic ‘stream of consciousness’ style to the material. Spanning 12 tracks and 32 minutes the material is mostly instrumental where there is an overarching hazy lo-fi aesthetic at play. Here the compositions rely on quirky groupings of elements which include: layered tribal-esque rhythms and beats, ritualistic gongs/ chimes, meandering bass, casio keyboards and programmed beats, weird synth soundscapes, samples choral vocals, overblown drone riffs etc. Where vocals are infrequently used they feature in a strangely twisted spoken disembodied style and to add to the twisted and disorientating nature of the tracks, they occasionally sound like multiple songs are being played over one another. The final album track ‘Pagan Fruit’ rates a mention for its beach sunset Americana vibe where layered bluesy but uplifting guitars shine. 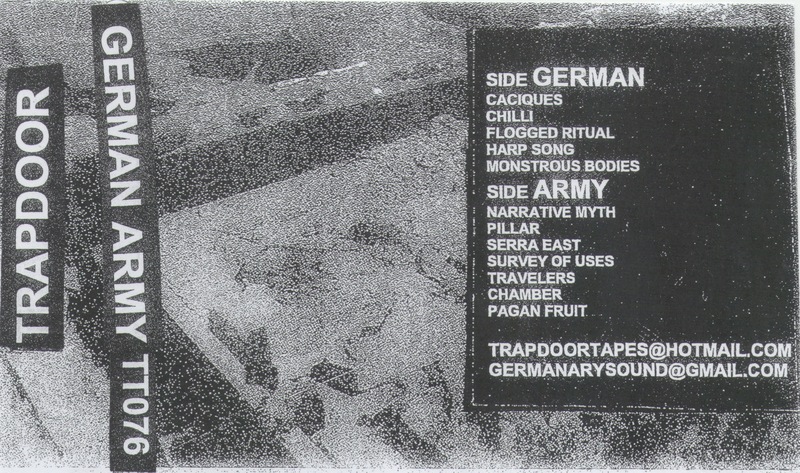 On this tape German Army retains a consistent quality of output, despite the hyper speed of new releases. For the final of the tapes Word of Life Church SS is not all like what the project name might suggest, meaning this is neither martial industrial nor power electronics. Rather the group’s sound delivers lo-fi analogue industrial noise soundscapes. For sake of context this Australian project appears to consist of a loose collective of contributors which have included the inputs of Ben Taylor, Harriet Kate Morgan, Luke Holland and Tom Miller depending on the release (…noting that Ben Taylor is not featured on this particular recording). Two lengthy untitled tracks make up this 30 minute tape, where the lo-fi, muddied post-industrial sprawling filth is loose and semi-improvised in feel. Likewise its subdued and muffled analogue rumble begs a comparison to a European ‘post-mortem’ cassette culture sound. With a hollow, muffled and distant echoed tone the atmosphere is one of slow grinding and general elevating menace. The flip side features a similar tone, where some stilted quasi militant percussion provides a muted semblance of structure which gradually gets buried under layered sonic grit. Being rather more subdued than my initial expectation, on face value this tape sounds more like a solo project than the product of a collective approach. An oppressive analogue electronic tape nonetheless. To wrap up the mini-label showcase, from sound to DIY visual aesthetic Trapdoor Tapes have a focused and well-rounded understanding of what they are seeking to achieve, and will surely please listeners who seek out industrial, noise and general weird underground musical obscurities. 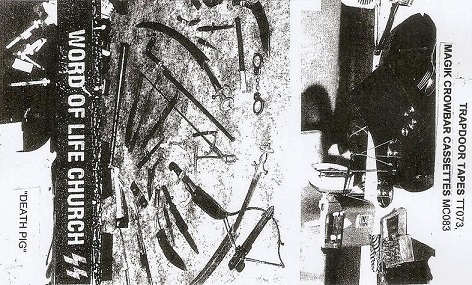 This entry was posted in 2013, 2014, industrial, noise, post punk, Trapdoor Tapes by noisereceptor. Bookmark the permalink.